AlphaNinja: Einhorn on the "Curse of the AAA"
AlphaNinja - While I'm sure this speech can be found at 1,000 finance sites today, its a must read, whether or not you agree with me that the ratings agencies are worthless. Earlier I linked to brief summary, the link above is the speech in full. "If your product is a stamp of approval where your highest rating is a curse to those that receive it, and is shunned by those who are supposed to use it, you have problems." "The truth is that nobody I know buys or uses Moody's credit ratings because they believe in the brand. They use it because it is part of a government created oligopoly and, often, because they are required to by law. As a classic oligopolist, Moody's earns exceedingly high margins while paying only the needed lip service to product quality. The real value of Moody's lies in its ability to cow the authorities into preserving its status." 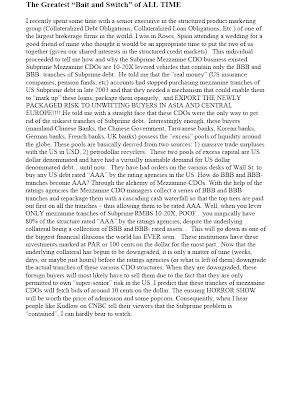 Alphaninja - I remember late 2007, discussing the ratings agencies with a contact who was putting together some of the very most toxic mortgage-backed-securities for a large bank. He said that "they (Moody's, S&P) come into the office and ask 'what do you want this to be rated'?" Then through insuring different tranches, etc., complete garbage can be turned into a AAA-rated security. People then trust this rating, and you end up with Norwegian fishing villages owning what they think is a risk-free investment that turns out to be horribly impaired. 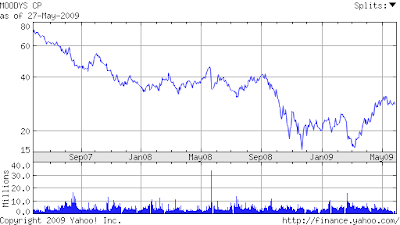 AlphaNinja - A VERY smart investor suggested I buy Moody's in the fall of 2007. He liked Moody's huge margins and protected business model. During our discussion I pointed out how useless their ratings had turned out to be. His response was "but SOMEONE has to rate these securities." Well I agree, and firms such as Egan Jones have stepped in with much better ratings. And at the end of the day a thorough analysis of earnings volatility, times-interest-earned, and other debt ratios can lead to a fairly reasonable assessment of creditworthiness for many debt securities. For exotic securities more work is needed, but the failure of the big 3 ratings agencies to do even a halfway competent analysis over the last few years should be a reason to strip them of their privileged, government-mandated book of business.